French Hi-Fidelity seems far away and withdrawed into its borders. But this is not true, there are many famous brands, both new and old. Among the many we find: Verdier, Triangle, Focal, Hiraga, Micromega, Metronome, Atoll, YBA, Lavardin, Davis, Cabasse just to list the first names that come to my mind. Some time ago, people used to say that the French sound was too peculiar to be exported because it had a tendency towards high pitched notes. But it was just a sort of myth and not something based on reality. There were systems that sounded very opened and others more rigid, now of that “French Sound” we hear no more, or better said there’s nothing that goes across the French borders. Domenico Pizzamiglio and myself are going to speak about a French brand, a young one since it was born in 2010, that is very appreciated for its DAC production. These DACs have had positive reviews both from the press and the audience. You can find, here, an interview by Domenico Pizzamiglio to M. Vincent Brient, founder and designer of Totaldac. 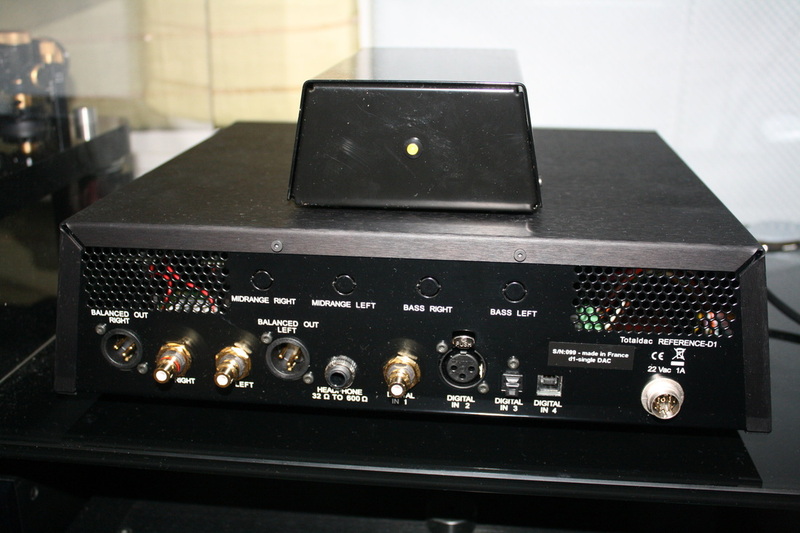 In the occasion of his visit in Brittany we have asked M. Brient to have his devices for a review and he gave us the A1 DAC, reviewed by Domenico, and the d1-single DAC that I have tested. The two reviews have been written separately and, as usual, we haven’t shared our opinions. If you find similarities, repetitions, points of contact or different points of view it is all completely casual and a sign of our freedom of thinking. There is the presentation of the Company on the web site http://www.totaldac.com so we will not speak about it. 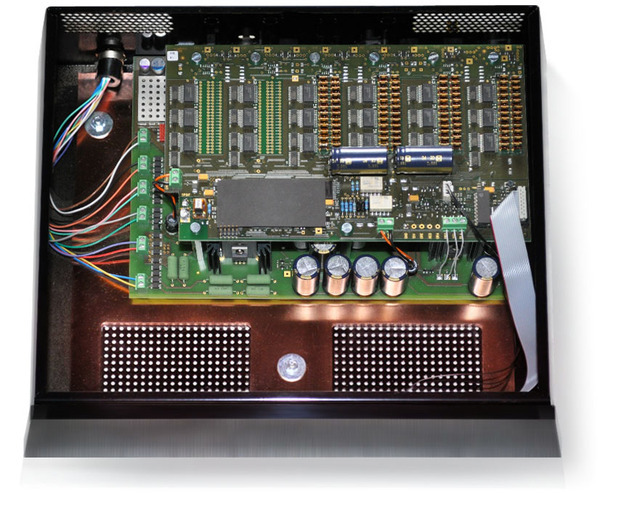 We want to highlight the technology used to build these DACs. They use homemade discrete components DACs, while for the jitter they use a FIFO system that stores 10 ms of audio data that are sent to a local oscillator “embedded custom clock with anti-jitter FIFO memory” threy explain. 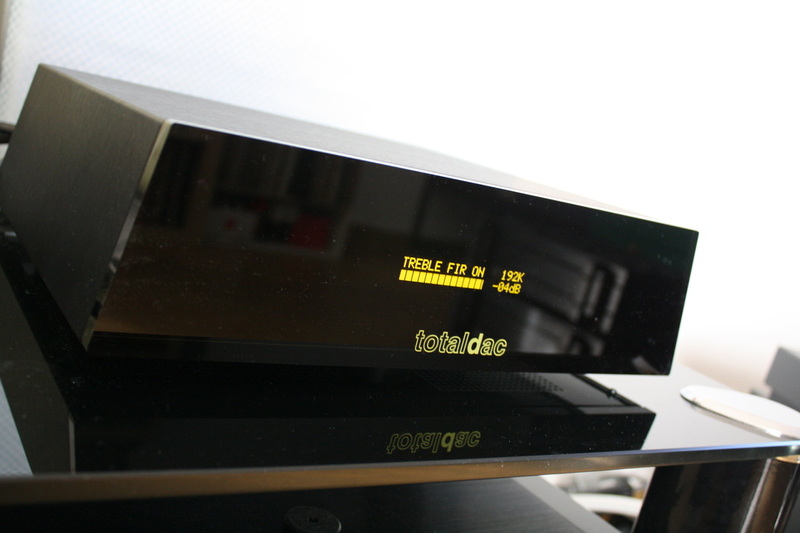 We are really proud to be the first in Italy to review Totaldac products. Audio Activity has an international reputation and this is thanks to you, dear readers, that follow us on a regular basis. The technical characteristics of Totaldac d1- single DAC are: a R2R ladder DAC for each channel with an unbalanced output even though it has working XLR outputs. The thick front panel is in plexiglass, it has a trapezoid shape with a small but easily readable central OLED display. On the back panel there are the analog outputs, an output for the headphone, an S/PDIF input, an AES-EBU input, an optical input and one usb port. Then there is the A/C connector with a discrete-regulated separated power source. The optical input receives up to 96 kHz, the other inputs receive up to 24 bit and 192 kHz. The remote adjusts the volume output, selects the 4 inputs, the absolute polarity, the ground connector, the digital filter - that we will describe later on - and the on/off switch. The remote is also very useful in selecting and choosing the many optionals that the manufacturer proposes, including a very complex crossover. The 2R2 DAC is manufactured using Vishay 0.01% resistors and there are 100 resistors for each stereo channel, just imagine how much it costs! The filter we have spoken about earlier is used to support the highest frequencies that are lessened by the zero sampling conversion; its support is clearly audible as we will point out later on. There are many optionals, please refer to the manufacturer’s website for a detailed list. The Totaldac has been connected to the following system: turntable Basis 2001, tonearm Graham 2.2, cartridge Scan Tech Lyra Helikon, phono preamplifier: Einstein "The Turntable's Choice", CD/SACD player dCS Puccini + Puccini U-Clock, preamplifier: MBL 4006, power amplifiers: Bryston 7B ST mono, loudspeakers: JBL 4350B, interconnect cables: MIT Oracle MA-X Proline, MIT Shotgun S2 RCA, Transparent Super XLR, Transparent SuperRCA,LAT International XLR, loudspeaker cables: MIT Magnum MA, Vovox Initio, power cables: MIT Shotgun AC 1, Black Noise Pearl and others DIY, mains distributor: Lector Edison 230/8, mains filter: Black Noise 2500. The first Cd I listen to is a Deutsche Grammophon “Die Shöpfung” (The Creation) by Haydn performed by Chor & Simphonieorchester des Bayerischen Rundfunks, directed by Leonard Bernstein. What I hear is very similar to the sound of my dCS, only a bit darker. This is very interesting, in fact it’s just like listening to the same execution in different concert halls or simply in different listening rooms. It is really hard to decide which one is more correct, it is a matter of personal liking. The hissing notes, for example. are only a bit blunted. We have the same impression listening to “Dedalo” (Enja) by Gianluigi Trovesi with the WDR Big Band. The low range is a bit “shorter” than the reference and gives the impression of being conveniently tamed. The dynamics is very good and the mid-range is well forwarded, and goes along well with Trovesi’s sax. Its ability to play even the most complex signals of the Big Band is really impressive. Mahler’s compositions have ample dynamic variations and we find this characteristics also in the 5th Symphony performed by the Dallas Symphony Orchestra directed by Andrew Litton (Dorian Recordings). The Totaldac knows how to recreate the dimensions and the strenght of the big orchestra but it can easily follow also the whisperings, and reproduces the pianissimo delicately and precisely. The fortissimo of the timpani and of the bass drums are as well an explosion of colours and sounds. Mahler is not among my favourites but with the performance of this device you can’t avoid the emotion. I do not reckon comparisons “On the fly” are useful. It is useless to change continuously the inputs trying to find the differences between two devices. What we want is to find out which device plays better, following criteria that are sometimes objectives and sometimes not. And to reach this aim it is important to listen carefully and for a long time to a device to elaborate the sensations that come from the different listenings of different songs and music genres. 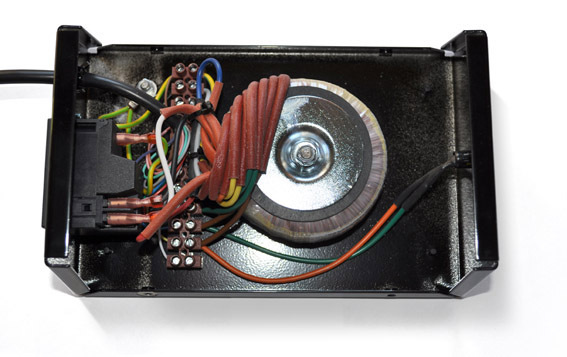 We have highlighted before the differences between Totaldac and dCS that is to say that the first has a slightly darker sound than that of the second one. And that’s it. But if you’d come to an end just knowing this you’d surely go wrong. If you listen to the entire Mahler's movement, once again you’ ll notice that from the dCS details and harmonics come out especially in the low level signals, while the d1 gives a different listening pleasure and an emotion unknown to the dCS. Well, which one shall we choose? The self-controlled British executor - the dCS - or the imaginative French interpreter - the d1? The decision is up to the reader, we review and then you choose what to buy and connect to your system. And I am happy I do not have to choose because after one month of listenings I am still undecided. I wish I could have both devices but this is not possible. By the way, for my listenings I have chosen to leave the treble filter on in order to have a bigger soundstage and the sensation of a wider dynamic range. Shifting to 24/96 files the hint of the high range noticed in the 16/44.1 files disappears and music flows more freely. The female voices in the song n°10 of the record “The Nordic Sound” 2L, suddenly materialize from the silence in the space among the two loudspeakers. We now want to add the variable of the filter/cable” d1” (once again) that M. Brient sent us. The filter has the same effect of a very good analog interconnect cable when compared with a cheap one. With the same tonal balance we have a higher resolution of the details than that obtained with my USB cable supplied by dCS with its U-Clock. Please note that this cable has golden pins and its performance is higher than that of a normal computer USB cable. A simple CD, stored on a hard disk and reproduced through JRiver has a resolution that the integrated dCS player does not reach, thanks to the combination computer+ filter+ converter. If you love to listen to computer music buy this filter that has a very competitive price, even if compared to good quality normal USB cables. In this case, it is not a matter of tastes, this cable simply eliminates the digital interferences that come from the source but it does not alter the tonal and timbre balance of your source. As for the converter, we have noticed a characteristic found in other similar devices generally hand made and tuned by ear: the sound is especially touching and has no digital artefacts, a real “zero-oversampling sound”. Many times this technology has a low performance at the highest frequencies but this device has overcome the problem using a brilliant and effective on board filter. As for the warranty, you have 2 years and the manufacturer can easily update your product. Just before finishing this review, Vincent told us that “d” series now accept also DSD signal in input. The price to pay is 320 euro + taxes. You can test and listen to Totaldac devices for 10 days before deciding to buy it. Vincent Brient must be very sure of the performance of his products. And he is right, we add after having tested them with thorough attention, all music lovers should listen to them just as attentively.